we all know that what AdSense is and why every blogger wants to get into it. 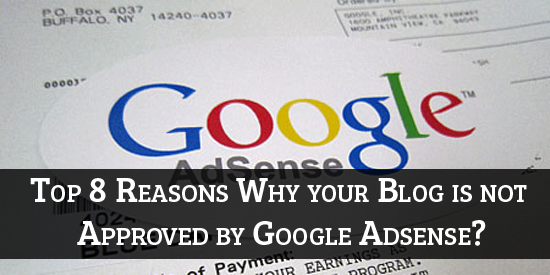 AdSense is the Best source for bloggers to monetize their blogs. Well, but AdSense does not approves everybody because of its TOS and it looks at all the websites submitted for approval very deeply before approving. Many newbies just starts off a blog and try to apply for AdSense but gets disapproved because of some small mistakes that they don't think that are big but later they get to know that it is not that easy to get approved and even some of them leaves blogging. So, Today I'm going to tell you what are the reasons that AdSense is not accepting you into their program. Copied Images :- This is being a common things to disapprove applications by Google AdSense because if you have copied some images from Google image Search then Google will disapprove your application stating "Sites Does not Comply With AdSense Policies". So, I recommended you to add only those images which are made originally by you. Well I understand that every blogger is not a designer itself so you can post your posts without adding images. Once you are approved then if you copy images from Google image then it does not matters. Recommended :- Best Google AdSense Alternatives – Make Money Online! Too much Ad networks :- This can be a big cause for getting your AdSense disapproved because if you already have too much advertising networks already on your site then there is no chance that AdSense will give even the first approval to you. So, If you want to get approved you must remove all the ad networks when applying for AdSense. So that these things do not come between to approve your AdSense account. One more thing if you have added any ad-fly website entry script or any other script then that is highly recommended to remove it before applying for Google Adsense. Less Number of Posts :- Well as said in the starting of post bloggers just starts their blog and try to apply for AdSense and gets disapproved and AdSense stats the problem as "Insufficient Content". So, you must have around 10 genuine written posts on your blog so that AdSense might approve you. If you have less posts then 10 then it might be difficult for you to get approved. Domain Type and Age :- Well, If you are using blogspot blogs and don't have it older then 6 months then it proved to be difficult for you to get approved. Even with 6 month old blogspot blogs it is much harder to get an AdSense account approved. So you must buy an .com domain for your blog. With .com domains there is no need for your domain to be 6 months old. Blog Content :- Yeah, your blog content matters more than anything else. So you must have genuine posts on your blog that are originally written by you else you won't be approved because you might have heard that Content is the king. So you must have genuine content on your blog to get approved. Age Verification :- You should be above 18 years to apply for Google AdSense. So before applying for Google AdSense make sure that you are shown as 18 years or older in your Google+ profile else you won't get approved by Google AdSense. If you are not 18 years old and wants to get an AdSense then you must have the payee name of your Father or any body else that totally depends on you. Address not Formatted Correctly :- If you have not filled your address correctly while applying for Google AdSense then do not think that you will get approved because AdSense also takes the address of the users because the payment of your AdSense account will be send to your address that you fill. So fill out your address correctly when applying for AdSense. Traffic :- Traffic plays an major role for you to get approved you must have around 50 page-views/day to get approved. Well sometime AdSense also approves the sites with less traffic but only sometime so be on the safer side and have some good traffic before applying. This will increase the chances of getting approved. Really useful. But a great doubt still ? Will i need to wait 6 months for .in domain ? You said in your post Domain should be 6 month old. Now you are saying it not a strict rule. But in Google policy and in any other site it is written your Blog should be 6 month OLD. Then You can ask when will Google see the domain age? Google will see for the domain age when your blog content has medium quality. That i got Bro. As i have also got my adsense account in just 1 month. But Why People Write in article that you need 6 month old blogspot blogs for apply in adsense. Hi! first a great article with really interactive site design.. doesn't really look like blogger. My adsense account was banned about 3 years ago (nothing to mention about it). Now i am going to make another blog with a different Google id, on a different topic, with real unique articles and no copyright infringement. So to apply for adsense, i am going to wait for some time in order to have nice visits and ranking (no risk). I read some articles which say that I cannot apply for adsense with the same IP Address (if that was blocked from adsense once), is it true? If so, how can i apply for a new blog? thanks for replying. are there some precautions that i should consider for my new blog? Do i need to have a search widget for my website ? - Site does not comply with Google policies. Let me know more Details like your blog traffic, age, etc. Really Good info Chan. But i have one question that sharing our post links in sites such as facebook, linkedin, and Some other groups will be Problem for approving Adsense? Suppose a person is getting traffic 100-500 through social networks then his account approved or not? is there any such rules? No Social Sharing doesn't have any relation for Adsense approval. iam new to blogger.i creared number of blog.while creating a new blog,its showing that sorry this blog address is not available.i want to know why it showing like this.please help me. I had a blog on wordpress.com and moved to self-hosted blog. My domain is 3.5 months old but my blog contains posts of 6 months old. I applied for adsense 2 time and rejected. Plz review my site http://techtopz.in . And plz tell me whats the problem. It was rejected - Site does not comply with google policy. Hi! I have created a bloggers blog related to Tour & Travel. I read about the policies that says we don't have to use copied content. I have some images copied from Google Images but now onwards I will not copy Images, will use my own. After adding more pages I want to apply for Adsese. So my question is should I need to Delete those Copied Images Or Can I still apply for adsense? is it necessary to have images in every post , if so then we are allowed to copy images from google image search..?? It's not a must to use images on blog post but using it will increase your blog post appeal and conversation rate. "An Image is better than thousand words"
Great post thanks for sharing, My blog meets all requirements u discuss above i had applied for Google adsense & my application is under review hope they will approved it. I have applied for Google AdSense account several times. But every time Google disapproved my account. I don’t understand what the problem is. I have 150+ post and all content are not copied. In August 2013 I have purchased a won domain [www.cybarlab.com] and transfer all the post form the blogger.com. But the published dates of some of my posts are remain before August 2013. Is this a drawback for approval? Make sure you removed all your Google Indexed links from your old domain blog. If possible create a permanent 302 redirect for all of your old blog post to new domain post. This way they don't think it's a copied content from your old blog (Also you will get extra traffic from your old blogspot domain). Hi my blog http://webthil.com is in under review for second verification. Can my blog get approved? How many days it will take for second verification? Last year i get google adsense approval than they disable my account due to invalid click. would you explain me i can get adsense account once again. if i create a new google account than i apply google adsense they approval for any other method we have. Please tell me that. Is there traffic is necessary for getting adsense.thanks. If yes then how can i increase my blog's traffic. My website is http://advancephp.com. I am not getting ad sense approval from Google.I have apply many times but didn't get approval.﻿ What can i do to get the google ad sense approval. Wow! Great post, am just seeing this for the first time "google search images" really? I have been wondering why my unique site is dissapproved saying"site does not comply with webmaster policy. Thanks for opening my eye! Am going to change allnow! I got approval from Google AdSense. & earned 13$ and requested for address verification code but don't reached to me after 2months. I applied also to google Adsense and got disapproved. I hope in next application it will succeed because I'm trying to optimize my blog http://www.androidpinas.com as per google policy stated. adsense approved on before 5 months also today my ads not showing blogger how is it reasons? bro , if I use .tk domain does it decrease the chance of approval? yes, it's better to buy a professional domain. Hi great posts i think i got the idea would you able to check my blog if this will be accepted on google adsense www.pinoyamazing.com I am from the philippines my blog is about tech. Than you and god bless. I have 4000 reviews every day and more than 1000 subscribers .is it approved by Google AdSense . Does it matter to copy images? Can a person apply for adsense for second time? If yes then after how much time?